Rubenerd: I’m 22, but I won’t wear one! I’m 22, but I won’t wear one! 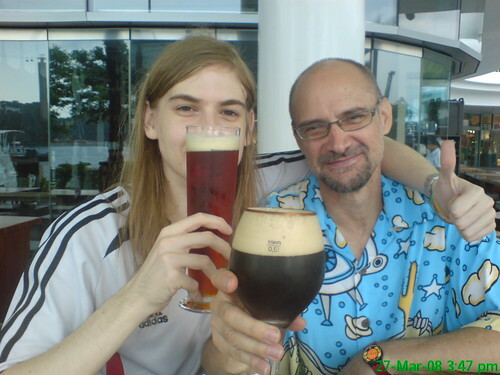 My dad and I at Brotzeit at Vivo city for my 22nd! Just don’t expect me to wear one! Hey come on, it’s the only time in my life when I’ll be able to say that! Thank you to all the fabulous people who have emailed me and Twittered birthday wishes! I also want to wish Frank Edward Nora's baby The Overnightscape a happy birthday too, which happens to fall on this exact same day… synchronicity! If you didn't read about it, he overhauled its logo recently too in celebration! Newer post ← UPS tracking excitement! Older post → A Whole Wheaty birthday!